Most of the Chicago area and northwest Indiana remain under a Winter Storm Warning through Friday evening, which also will impact Friday morning rush hour traffic. 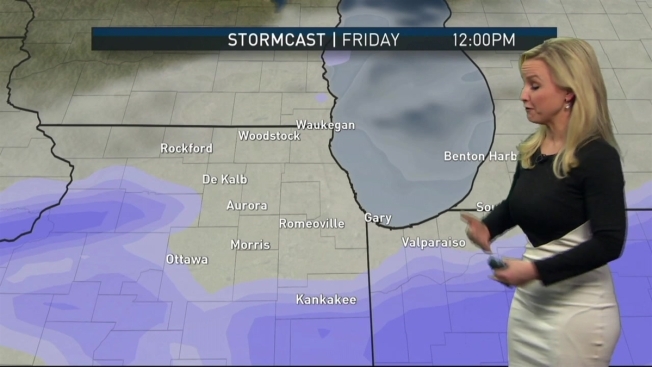 Kalee Dionne is tracking a significant snowstorm headed for the Chicago area. The first phase of what is expected to be the largest snowstorm so far this season could move into some parts of the Chicago area, particularly south and west, on Thursday evening during rush hour. The National Weather Service warned motorists to be prepared for "signficant reductions in visibility at times." The weather service also said travel will be "very difficult to impossible at times, including during the morning commute on Friday." Driving during this time was "highly discouraged" by the Illinois Department of Transportation, and suburban Chicago transit system Pace sent out a weather advisory Thursday to its customers, recommending they avoid travel starting this evening as a winter storm takes aim at the area. The Illinois Tollway on Thursday morning prepared its fleet of snowplows in advance of the storm. "If you must travel, allow additional time," the tollway said. "Go slow and leave extra distance between you and the vehicle in front of you." If help is needed, the tollway reminds drivers to "stay in your car and dial *999." The Chicago Transit Authority said it anticipates normal service on Friday. "CTA has a strong track record of maintaining bus and rail service during the winter months, even during some of the recent snowiest and coldest winters in Chicago history."